Format: The winner of the first eleven games to be declared the victor, draws not counting. Thematic Rule: Both players were compelled to start each game 1.e4 e5. Prize: $1000 ($500 a side). Note: Games 10 through 17 are ordered solely for navigation purposes as the true sequence is unknown at this time. Games highlighted in yellow are missing from this collection. Roll of the Field and Staff of the Twenty-Fourth Kentucky Volunteer Infantry. Name: James H. Turner;	Rank: Adjutant;	Enrolled: Oct. 15, '61; Mustered In When: Jan. 6, '62; Mustered in Where: Lexington, Ky.; Period: 3 yrs. To Correspondents.—S. L. [and others].—We are not at liberty just now to give full particulars of the coming match. We may state, however, that nearly all the preliminaries are already settled; that it will be played at Washington in the course of next month; that one of the principals in the contest has for some years sustained the reputation of being the strongest player in America, and that its terms are those of equality in the strictest sense. Mr. Lowenthal has recently played a number of games with Mr. Stanley, who, as our Chess readers know, manages this corner of the Albion. So far the result has been equal. Mr. Stanley himself has now gone to Washington, for the purpose of playing a match there for $500 with a gentleman from the West, whose name we are not at liberty to mention. The Late Great Match At Washington.—All necessary preliminaries having been duly settled by previous correspondence, the principals in this exciting struggle met for the first time at Washington on the evening of Saturday, the 9th instant, and commenced play on the Monday following. Mr. Turner of Lexington, Kentucky, was accompanied by Mr. E. F—, of Cincinnatti [sic], while Mr. E. E—, a brother Englishman and likewise resident of New York, acted for Mr. Stanley, in the capacity of second. It would be, perhaps, superfluous to remark that, from the time when the approach of the coming trial of skill was first whispered, throughout the entire conduct of the match, the most friendly feelings were manifested by all parties concerned. We may truly say, in fact, that between the combatants, consideration and courtesy for and toward each other formed a leading characteristic of this most harmonious contest. One other feature, as observable in the department of one of the players, we cannot help remarking. We allude to the unflinching courage displayed by Mr. Turner—indeed a fit representative of Kentucky State—in the firm stand which he made against his formidable antagonist, after having been so severely worsted in the first onset. Of the first six games played, Mr. Stanley succeeded in winning five, the remaining game having terminated in a draw. Subsequently to this period of the match, Mr. Turner scored five, against the six obtained by Mr. Stanley; the final state of the score, at the conclusion of play on Thursday evening of last week, being consequently as follows:— Stanley, 11; Turner, 5; drawn 1; total of the games played, 17. We shall now proceed to present our readers with a few of the games occurring in this match, premising that each party was bound to play his king's pawn, two squares, for the first move. The amateurs of the Royal game will be gratified to learn that the preliminaries for a grand encounter between Mr. C. G. Stanley, the English player, who so distinguished himself in the celebrated contest at New Orleans, in 1846 [sic], and Mr. J. H. T—, of Louisville, Kentucky, have been definitely settled. As far as we are present are informed, the terms agreed on are, that the match shall take place at Washington, and commence on the 11th of February. The winner of the first eleven games to be conqueror, and entitled to the stakes of 500 dollars on each side. To avoid the tedium so often complained of in what are called the close games, it is stipulated that both players on the first move shall open by advancing the K.'s pawn to his K.'s 4th sq. For 1000 Dollars.-Termination Of The Contest. By the arrival of the Europa we are favoured with the particulars of this contest, which, with the characteristic impetuosity of our transatlantic friends, has been brought to a close in fewer days than a match of such importance here would have occupied weeks. Owing to the dangerous illness of Mr. Stanley (the English competitor), who for a fortnight previously had been confined to his chamber, the belligerents did not meet at Washington before the 9th of February; the preliminaries, however, were so speedily settled, that play began on the 11th, and by the evening of the 14th the battle, consisting of seventeen games, was at an end! In games played under such circumstances, it would, of course, be idle to look for any of those profound and thoughtful combinations - those brilliant and daring stratagems, which by turns delight and electrify us in the match games of the best European players of modern days. But though deficient in the higher qualities of Chess skill, there is a certain spirit and piquancy about some of these parties which are sure to render them attractive to the multitude; superadded to which is the interest inseparable from them, of their constituting the first fair stand-up fight at Chess betwixt an Englishman and an American; so that we have little doubt of their commanding a due share of attention from the amateurs of this country, and exciting a good deal of speculation as to the result of a return match, which we hear will come off at New York in a few weeks. J. H. Turner . . . 5 "
Drawn . . . 1 "
In 1850 a match, which excited considerable interest, was played at the city of Washington. The combatants were Mr. Charles H. Stanley of New York City, and Mr. J. H. Turner of Mount Sterling, Kentucky. The latter gentleman, as is related, imagining that he had discovered and thoroughly analyzed an invincible attack in the King's Knight's Gambit, boldly challenged Mr. Stanley, then the recognised champion of the country. Mr. Turner supposed that by playing the above-mentioned opening whenever he should have the first most, he would be certain of scoring at least one-half of the games. Unfortunately Mr. Stanley, in the very first King's Gambit which occurred, lighted upon a defensive move which paralyzed the attack, and which had escaped the notice of his opponent. Still, Mr. Turner, considering the strength and renown of his adversary came off creditably. The match was commenced on February 11th, and came to an end on February 14th., it resulted Stanley 11, Turner 5, drawn 1. [...] The match commenced on Monday last, the 11th instant, when Mr. Stanley won three games, and a fourth was drawn. Staunton: We prefer playing 5.d4; because it gives freedom to White's game, while it confines his adversary's. Staunton: Mr. Stanley's old ward, which he acquired, in days long past among the redoubtables of merrie England. Stanley: White's game is now well opened, and his position very commanding, his forces being so concentrated that they are alike available for the purposes of attack or defence. Staunton: 11.Qd2 looks much stronger. Stanley: We conceive this to be an inferior move; as nothing can now prevent White from presently establishing one of his knights at f5. Stanley: Had the black queen been at home, White would not have ventured on this move at Mr. Turner could then surely have captured 13...Nxe4. Staunton: These knights in combination are terrible adversaries to cope with, especially when they gain so favourable a position for attack as the present. Staunton: After this we should give little for Black's game. Staunton: For a moment, the necessity of capturing with this pawn seems to retard White's attack, but it is only for a moment, since the opening made for his f-rook and queen to sweep the f-file gives additional force to the assault in a move or two. Stanley: This does not give relief where the shoe pinches. Mr. Turner's position was critical even prior to this move; but now his case is quite hopeless. Staunton: We will not pretend to comprehend the purport of this move, but give it up as quite beyond our fathom. Staunton: A light breaks in upon us! Black might have meant, by moving his rook away, to tempt his opponent to take the g-pawn, thinking that if he did so this move of the knight would enable the black king to win the adverse knight. If this was really the object of the rook's move, Mr. Turner evidently overlooked 19.Nxe6, and could have examined the position but very superficially indeed. Staunton: Mr. Stanley has now got the game in his own hands, and finishes it with his accustomed vigour and ability. The Late Great Match At Washington. Staunton: Mr. Turner, we learn, is profoundly versed in all the bookish theoric of the gambits; while Mr. Stanley is confessedly ignorant of these perilous openings both in theory and practice too. Stanley: It is the opinion of Mr. Turner, whose knowledge of the opening now before us is scarcely surpassed by that of any player of the day, that this move is far preferable to 7...c6. In our own mind, late experience has given rise to a doubt, whether the latter defence is tenable. Stanley: A most galling attack is now commenced, which is carried on with great spirit by first player. Staunton: The attack obtained by sacrificing the knight at this point is not sufficient to warrant it in a match game. Staunton: White plays this opening with great spirit and determination. Stanley: The policy of this move may be questioned, as it is equivalent to an abandonment of the option of castling on the king's side. Staunton: Black has now a very cramped uncomfortable sort of game; his best pieces are all out of play, and those in the field have scarcely any scope for their powers. Stanley: The loss of a piece is now inevitable, as the result will show. It would probably, therefore, be a wiser course to take the bull by the horns, and play 15...c6 or 15...Ne5. Staunton: As the knight must perforce be played to e5 presently, it would certainly have been better to move him there at once. Staunton: 16.Bg8 seems also a good move. Staunton: With so fine a position as White now has, it is difficult to understand how he could permit his advantage to ooze from him in the way he does. Stanley: A judicious move; White's threatened attack on the position of adverse king requires instant attention. Stanley: To have captured 24.gxh4 would have been obviously fatal. Staunton: If 24.gxh4, Black must have won the game. Stanley: We do not admire Black's play at this period of the game. His chance of winning would certainly not be deteriorated by 37...c4. Stanley: A grave error is here committed; one, in fact, which should cost Black the game. His correct play would have been 46...hxg3+. Staunton: This move ought to have cost the game. Staunton: Instead of retreating his king, he had simply to play 51.Nf1, and the adverse pawns must have fallen in detail speedily. Stanley: A singularly ill-judged move, after which the game is drawn by force. Staunton: At this point we doubt if White could win; for suppose, 55.Kxe4 Kh3 56.Kf3 and Black is stalemated. Staunton: Mr. Stanley plays a more close and cautious style of game in the present match, than was his wont. We should like to have seen 5.d4. Staunton: 9.Bxe6, followed by 10.Qb3, looks more attacking. Staunton: A series of exchanges so early in the conflict, detracts very much from its after interest. Staunton: An insidious retreat, tempting Black to push forward with his h-pawn or the knight, either of which must compromise his position. Staunton: Fatal, as the least consideration would have shown. Staunton: White might have gained a vigorous attack by sacrificing his knight at this crisis, for suppose: 11.Nxf3 gxf3 12.Qxf3 Rf8 (12...0-0 13.Bxf7+ Rxf7 (best) 14.Qxf7+ Kh8 15.Qxh5+ Kg8 16.Qf7+ Kh8 17.Rf4 and White must win easily. If he play 12...Be6, White may advance 13.d5, etc.) 13.Bxf7+ Kd7 14.Qxh5, etc. Staunton: It appears to us that White might have won the exchange and have greatly embarrassed his opponent by now moving 16.Ng6, for if Black took the knight he must have lost the game, as the following moves will show: 16.Ng6 fxg6 17.Qxg6+ Ke7 18.e5 dxe5 19.dxe5 and must win. Staunton: This looks like lost time. He should have advanced the pawns with spirit on the king's entrenchment, in this fashion: 23.d5 b6 (to save his knight) 24.b4 Nb7 25.a4 and Black's forces are all locked up. Staunton: Mr. Turner has an aptitude for gaining and throwing away an attack that is truly remarkable. Who would have supposed that such an advantage as White had gained in the first dozen moves, could have dwindled away to nothing by this time? Staunton: Well played, as we shall find directly. Staunton: It is quite evident that by taking the knight he must have lost his rook. Staunton: Threatening mate, if the bishop is taken. [...] On Tuesday, Mr. Stanley won two games and Mr. Turner two. Staunton: If 5.Bb3, his opponent answers with 5...Qg5, and gets the better game. Staunton: Throwing away a clear piece. Why not have advanced the a-pawn, and then if White attacked the queen with 13.Ba3, have played 13...c5? Staunton: White might have gained a fine attack and have ensured the winning a piece in return, by taking 11.Nxf3 at his juncture (see the first note to a similar position in the fourth game). Stanley: The combination now about to be developed is of bold conception on the part of Black; his entire defence from this point being conducted on the system of counter attack; and that of the most violent and fearless order. Stanley: It will be observed that the winning of the exchange is already assured to Mr. Turner; the loss of which, however, has evidently been taken into the calculations of his adversary. Staunton: This seems to give White some advantage; but his opponent very quickly turns the tables on him, as will be seen. Stanley: A killing move; annihilation would speedily follow any attempt on the part of White to preserve the bishop, as, should he capture 16.Bxd5, Black plays 16...Qe2, forcing a checkmate instanter. Staunton: A master-touch. Nullifying all White's fine attack, and winning a piece off-hand. Stanley: No doubt his best play under the circumstances, which, however, are adverse in the extreme. Staunton: Had he taken 16.Bxd5, Black would have played 16...Qe2, and have won easily. Stanley: We are informed by Mr. Turner that his faith in the King's Knight's Gambit was somewhat shaken by this result; and throughout the remainder of the games forming the Washington match, we consequently find no more gambits. Staunton: The last few moves are in Mr. Stanley's best style; and the game altogether a brilliant and amusing specimen of the gambit. Staunton: The opening of this game is remarkable for nothing but the timid sameness of the play on both sides. Staunton: 20.Red6 would be showy but unsound. Stanley: Profitting by late experience in the Giuoco Piano opening Mr. Turner has on this occasion played warily and well. We should now take his game, for choice. Stanley: An apparent want of fixedness of purpose on the part of Black augurs but ill for his success. Staunton: He must exchange, disadvantageous as it is to do so, or lose his f5-pawn at once. We should have preferred the latter alternative we believe. Staunton: Threatening to gain a pawn at least. Staunton: Better perhaps to have taken 28...exf2+. Staunton: Having in view the playing Rf3. Stanley: A desperate effort is now commenced by Mr. Stanley to retrieve a bad game; the chess student will do well to examine with care the moves now made by either party. Staunton: Our young friends on looking well at the position, will soon understand why Black does not take the knight. Staunton: 43...Kh8 look better, because it leave the adverse knight en prise. Stanley: Sailing very close to the wind; the greatest care is still necessary to keep out of the breakers. Stanley: Wisely avoiding the knight's check, which would have proved fatal. Staunton: If 52...Kh8, or 52...Kf8, he must evidently have lost his queen. Stanley: We are inclined to think that 56.Nd5 would have been better play. Stanley: Decidedly inferior to 60.Qg3+. The latter move would have necessitated 60...Be5, rendering ultimate victory on his part, at least difficult, if not doubtful. Chess In The United States. Continuation Of The Games In The Late Great Match At Washington. Staunton: The usual play now is 5.d4; and if the second player take 5...exd4, to castle immediately. Instead of taking the pawn, he may, however, retreat his bishop, but in any case we think the first player has the advantage. Let us suppose: 5.d4 Bb6 6.dxe5 Nxe5 7.Nxe5 Qxe5 8.0-0 d6 9.Kh1 Be6 10.f4, etc. Staunton: Desperate temerity in the face of such a position as White has got. Staunton: The prominent defect in this gentleman's play is, that when he has gained an advantage, whether of situation of material, he never clinches it. Why this pusillanimous retreat, when a few bold steps must lead to victory? Let us suppose that he has played instead 24.Bd3 Kg7 (this appears to be as good a move as he can make to avert the fatal consequences of White's threatened play of 25.Nd7 or 25.Ng4) 25.Bxg5 hxg5 26.Qxg5+ Kh8 27.Qh6+ Kg8 28.Nd7 and Black cannot save the game. Staunton: And White ultimately won the game. [...] This morning (Wednesday) Mr. Turner was the winner of the only game which has been played up to dinner time. The longest game yet disposed of, was that of to-day, which lasted two hours and twenty minutes; the shortest, a very brilliant one, in which Mr. Stanley was victor, was over in twenty minutes. 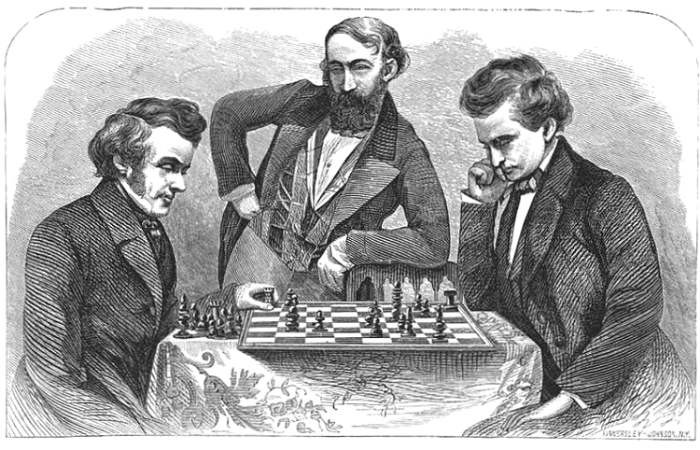 Great interest prevails here regarding this war of skill, but only in consequence of Mr. Stanley’s established reputation as the best chess player in America, and the high value set upon Mr. Turner’s capabilities wherever he is known; but because the contest is carried on in a mast chivalrous spirit, and with an unfeigned appreciation on either side of the qualities and skill of the other. I strongly suspect given the era, that dinner in this context, i.e. "This morning", would have been the noon meal, or more commonly known today as lunch. This would allow for a large number of games to still be played during the remainder of the day. As the participants were on a four-game-per-day pace, it would appear that three or four additional games could have been played on Wednesday with the remaining games contested on Thursday. Staunton: What could this be for? Staunton: 45.Ne5 looks more to the purpose. In that case the following moves are likely: 45.Ne5 Rd5 46.Nxc7 Bxc7 (46...Rxe5 47.Rxb6 and White has a fair chance of making a drawn battle) 47.Rxc7+ and White ought to draw the game. Staunton: A fatal error. He should have played 58.Ke6. Staunton: It is pretty evident that on taking 14...Nxh5 he must have lost a knight and pawn in return, besides the privilege of castling. Staunton: He might have won another pawn by 20.Bxg8 at this moment. Staunton: Few mental tasks require the faculties to be more nicely attuned than chess playing. Here is an oversight which would appear incredible to any one who had not experienced the remarkable influence which even a slight derangement of health exercises over the reason and memory in this game. White obviously intended 26.Bxg8 and then the pawn, but by the absurd hysteron proteron of taking the pawn first loses a won game. Staunton: This smacks a little too much of the go-a-head school for an important match game. Black, however, had probably by this time got so many games in advance, that he could afford to risk one without much danger. Staunton: 13.Bg5 with the object of forcing 13...Qe8, seems at first sight a good preliminary move here, but upon examination, it leads to no better result for White than the play adopted. Staunton: We should have preferred playing 17.Nc4. Staunton: If he had ventured to take 35.Qxd6, Black would have won the game off hand: 35.Qxd6 Rf1+ 36.Rxf1 (must) 36...Qxd6. Staunton: This is purposeless. Why not 37.Qd7? For suppose: 37.Qd7 Rf6 38.Qe8+ Kh7 39.Nxd5 R-moves 40.Ne7 and White must win. Staunton: This portion of the game is very indifferently played by Mr. Turner. Staunton: Why give up the piece? 39.Re1 would have saved it, and at the same time have obliged Black to look to his own safety. Staunton: And Black ultimately won the game. Staunton: Threatening to win a piece next move. Staunton: If he had interposed 13...Nd7, White would have won the bishop; if he had played 13...Bd7, White would have planted his knight at f5, with a fine attacking position; and if lastly he had played 13...c6, White, by advancing 14.d5, must have gained an advantage in situation immediately. Staunton: This is bad enough, but it is hard to find him a better resource. Staunton: The terminating moves are capitally played by Mr. Stanley. Staunton: And in a few moves Black struck his flag. Com. Moore and Capt. Boyle, Elwood Fisher and three Mohawks, were there also. These two young Mohawk squaws looked superb, they were the only two people in the room who kept their hats on. They are Christians, and with their brother, are to give an Indian concert to-morrow night at the Temperance Hall. They were decidedly the lionesses of the East room, and are really pretty. The lions of the night were first Dr. Gwin, of California, and the two great chess players, Stanley and Turner. Mr. Stanley finished his games yesterday, winning eleven to his antagonist’s five.—He drew the $2000 to-day from Corcoran and Riggs, and pockets a clear tin, $1000. The following etching by the Henry Kinnersley and David G Johnson company, New York, is stated by Miron J. Hazeltine, in Brevity and Brilliancy in Chess, New York 1866, p(xi), to be of "J. H. Turner, Esq. against Charles H. Stanley, Esq., with the renowned Herr J. Löwenthal honoring the contest with his presence. The match was fought at Washington some 20 years since [...]"
Based upon Löwenthal's recollection (quoted in part below) of arriving in New York with Stanley leaving shortly thereafter for Washington, and then "when he returned victorious, he introduced me to the leading members of the New York Chess Circle", making absolutely no mention of journeying to Washington to witness the match, I strongly suspect that the etching is actually based upon the daguerreotype Stanley offers up as a prize in 1854 (see Albion quotes below). The daguerreotype was probably produced in New York, after the match in Washington and prior to Turner and Löwenthal departing for Kentucky on March 3rd, 1850. It is also worth mentioning that the Albion of February 9, 1850, makes no mention of Löwenthal departing with Stanley when the latter leaves for Washington. One day, oppressed by the feeling of loneliness which comes over a stranger in a crowded city, and perplexed at the dark prospects before me, I wandered into a reading-room and took up the New York Albion. The first thing which caught my eye was a diagram with a position upon it. If a benevolent magician had waved his hand over me, the change could not have been greater. In a moment my old love for Chess revived, with a vividness I had never before experienced. It seemed as if it had grown into a passion after, for a few weeks, lying latent. The sense of loneliness vanished. I could find Chess-players, and a common love for Chess was, I knew, a sort of freemasonry. I could not leave the room before I had solved the problem. All night I fought in dreams many old battles over again, and anticipated combats yet to come. The next morning I called on the editor of the Albion, who received me very kindly, and gave me his card as an introduction to Mr. Stanley of the British Consulate—a gentleman with whose name I was already familiar. Mr. Stanley gave me a most hospitable reception. I spent that evening at his house, and played with him; the result being, I think, even games. In Mr. Stanley's style of play, I found very much to admire, particularly the originality and invention displayed by him in the openings. This was especially remarkable in the Knight's Game, in which he introduced the method, since approved by the best Chess authorities, of bringing both the Knights over to the King's side, thus giving, additional safety to the King, and preparing a strong attack. I cannot allow the opportunity to pass, without expressing the deep obligations Mr. Stanley placed me under by his unvarying kindness, and the constant exertions he made to advance my interests. It was about this time that Mr. Stanley left for Washington, to play his match with Mr. Turner; and when he returned victorious, he introduced me to the leading members of the New York Chess Circle, who were in the habit of meeting at the Carlton House, Broadway. There I met Mr. Thompson, whose frequent visits to Europe had caused him to be well known in European Chess circles, and in several encounters with him I had much the best of the play. I also made the acquaintance of Mr. Perrin, the present Honorary Secretary of the New York Chess Club, and Mr. Evert, to both of whom I successfully gave odds. My first formal match was with Mr. Turner. It was arranged for me by the kind offices of Mr. Stanley and Mr. Thompson, and was played at New York. In this and another match, which immediately followed, I was the conqueror; but I regret to say that I have not preserved any of the games. Mr. Turner struck me as a player of great natural talent and strong imagination, but somewhat too liable to be carried away by a brilliant combination or a dashing coup. In Mr. Turner I found a generous friend. He kindly invited me to accompany him to his residence near Lexington (Kentucky); my old thought of turning farmer reviving, I accepted the invitation. We left on the 3d of March, 1850. By the way we should much like to get up among our contributors a little spirit of rivalry in the matter of original Problems; and for the encouragement thereof know ye that C. H. S. has a fine Daguerreotype Chess Picture, containing capital likenesses of the parties by whom the well known match at Washington was contested (J. W [sic]. T. and C. H. S.); also of Mr. Lowenthal, the celebrated Hungarian player, as a looker of the game. The picture C. H. S. proposes to present to the author of The Best Five Move Problem contributed for publication to this paper. A committee of three amateurs to award the prize; and tenders to be sent in prior to the 10th day of February, 1855. The Five Move Prize Problems.—In accordance with the unanimous decision of three members of the New York Chess Club, who kindly consented to act as a Committee for such purpose, the prize offered for the best five move Problem contributed for publication in this journal has been awarded to our old and clever correspondent Mr. Denis Julien, as author of Problem No. 321, the first of this Series. We fully concur in this decision; and congratulate D. J. the more heartily on his success in that, among his rival competitors were some of our very able contributors—inclusive of E. B. C. and F. B.